With Final Fantasy 7's remake now being official, many of us were salivating over the thought of a brand new, shinier and up to date version of the title, but several of the more die hard fans grew concerned that too many things would be changed and became sceptical of the direction Final Fantasy 7's remake may be headed. So, just what exactly should we be expecting and is it likely Square will remain true to the original release of 7 in every way possible? To begin with, updating the graphics is a step in the right direction because although the nostalgia is great, it is pretty hard to go back to a title nearly twenty years old, especially when it shows. Many people today won't appreciate or fully understand the transition of Cloud's cuboid thighs or biceps moving into the world of shapely, anatomically correct appendages, of which we've come to expect in modern day titles. The plus here however is that the newer generation of gamers who may have once been put off by the now heavily dated graphics, are far more likely to enjoy Final Fantasy 7, while I'm sure those of us who played the original release will be happy to experience the title once more with a fresh new take on it. Square sure have a colossal task on their hands with this one, though. To bring a game up to today's standard means a complete overhaul, not just by how the game looks, but also how it plays and feels. Completely re-modelling and re-texturing all aspects of the game is one thing, but when you consider all environments of the original were hand drawn backgrounds, working out how everything will fit together in a three dimensional space, re-working all sound and deciding on whether the gameplay will remain turn based (with a party of three), if the story elements will be identical to what they were before, if we'll include text boxes or add voices to every character in the game no matter their importance, the job at hand is absolutely huge. Interestingly, back when FF7 was first released, voice acting wasn't really a thing within the gaming industry. At least, not to the level it is now. Everything was explained and narrated through text boxes. In fact, FF7 allowed you to change the colour of these text boxes, along with every characters name. Although there was no voice acting in the game, reading text from the characters perspective and imagining the voices to fit each one was all part of the fun and charm of it all. Times have changed though. Most people would rather have voice actors than text boxes and because of this, will fans appreciate anything being changed I wonder? It's unlikely, because then the nostalgia will likely be little to non-existent, but to counter this argument those who don't want to risk their favourite game of all time being sullied could just stick with the original release and revel in nostalgia once more. 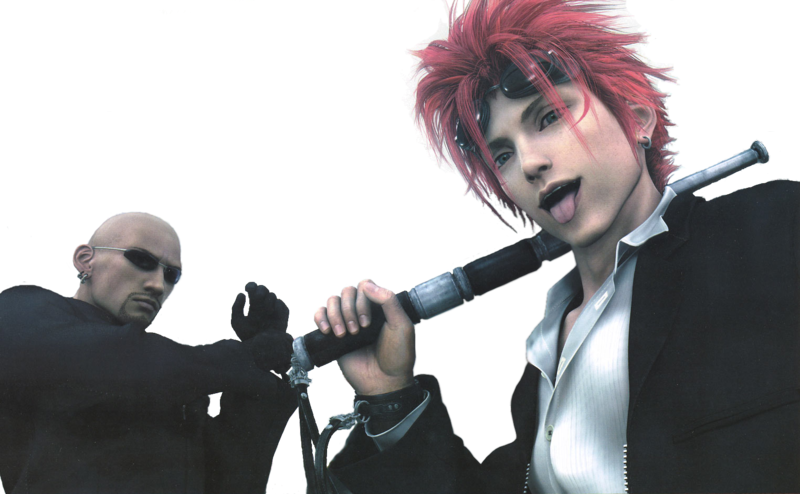 The main topic right now is that yes, the scene where Cloud had to dress up as a woman to deceive a Mob Boss with a questionable agenda will still be included, but to what extent? I've read a few other articles around the web and supposedly the original story and all that it encompasses will remain untouched and intact, also with some new additional content. If this is the case, I'd say this is the best scenario we can expect. It makes replaying the game worthwhile and gives fans of old something to look forward to. Why? Well, because Final Fantasy 7 is quite possibly Square and Yoshinori Kitase' greatest story of all time and additional content for me, can only be a good thing provided it's not unnecessarily silly in any way. FF7 has many memorable moments and although I can see certain scenes changing slightly, I'd still like to think as much emphasis needed during key parts of the story will remain. I remember being at a friends house at the time, but there's a certain scene with Aeries (Aerith to our friends in the US - ah, translation errors) and Sephiroth that literally made me cry during my over-emotional childhood. I hid my tears and hadn't even seen more than a couple of hours of the game at this point, but the impact it had on me was incredibly strong. Final Fantasy 7 is a very human and emotional tale, that is of course once you get past the fact everyone is massively overpowered and living in a strange world filled with monsters. Even so, each character holds relatable traits. 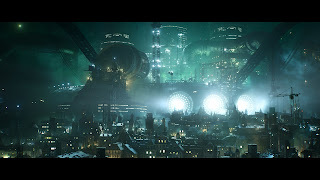 For fans of the original, do you ever wonder what The Golden Saucer will look like, what it'll feel like venturing to the top of Shinra tower once more, or what we'll have to do in order to find Vincent this time around? If it's the same, do you feel they'll change the "code" but give fans of the original who remember it a special in-game surprise or message? Maybe we'll get a new type of Materia. An Iron Giant, deep within the Earth's Crater. To those new to the series, Materia is what's used for everything magical. If you want to use "Bolt 2" (the equivalent to Thundara in recent titles) against an enemy, you need Materia. If you want to summon against an enemy, you need Materia. These magical instruments are small spherical balls that come in many colours and ranges. Some can multiply the effects of other types once linked (yes, you could link types together to become even more powerful) while others just generally give you more abilities. Connecting a quad powered Materia to Knights of the Round basically meant almost instant death to any Boss within the game. 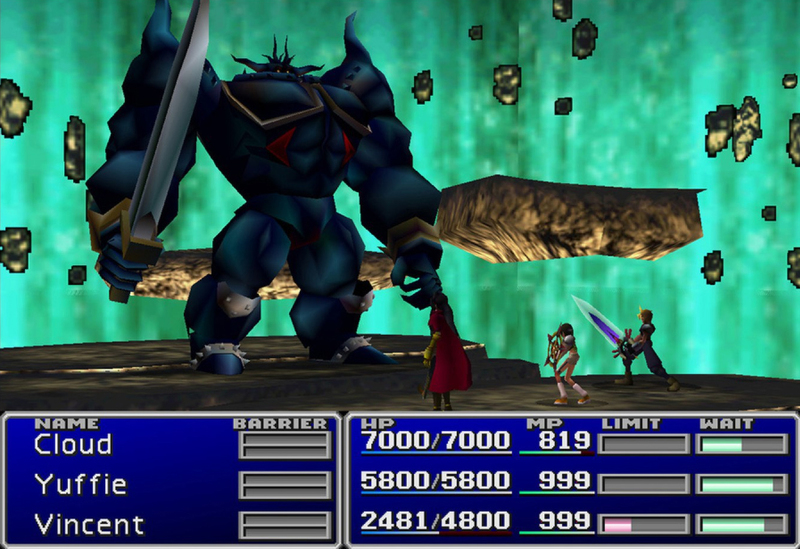 Just like more recent Final Fantasy's however, there are certain Bosses that take A LOT of damage before their less than graceful selves hit the deck. FF7 had two in fact - Emerald and Ruby Weapon. These were genderless weapons created by the planet, of which both were incredibly tough to fight, Emerald especially, due to the situation you had to face it under. There are also limit breaks. Limit Breaks are essentially ultimate moves your characters can pull off once they've taken a set amount of damage. With Cloud, the main protagonist of the game, his first Limit Break is Braver. The move itself is incredibly satisfying to watch, but as you progress through the game you end up unlocking more, with Omnislash becoming the most overpowered and satisfying version of all, to me at least. Regardless, there are a lot to learn, discover and experience. A memorable and brilliant cast. There were also nine characters to find, acquire and choose between, all of which had a vast amount of weapons to find and equip. It was also worth training and levelling up each character due to certain events that take place over the course of the game. The nine characters are as follows; Aeries, Barrett, Cait Sith, Cid, Cloud, Red XIII, Tifa, Vincent and Yuffie. 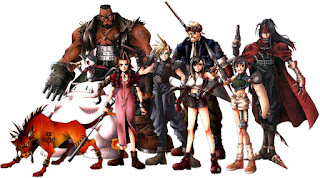 Now, I won't go into detail about these characters because there are wiki pages that exist for that, but I will say I never liked having Yuffie in my team and you'll just have to find the reason why this is for yourselves. It's something which should be experienced first hand, provided Square stay true to the character and how she acts within your party. 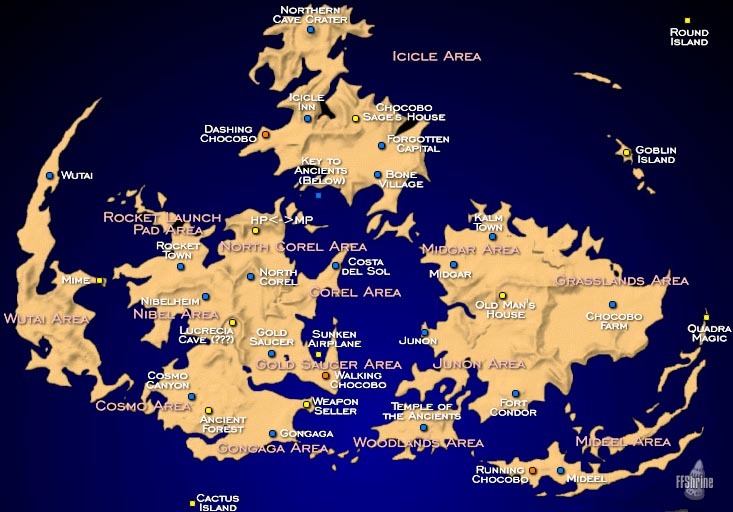 FF7 also featured a world map, where, depending on what method of transport you chose, certain areas could only be found via a corresponding method of transport. For example, you could run from City to City, hitch a ride on a giant yellow bird (Chocobo! ), sail to a cove in a boat or circumnavigate the world in an airship. There was one small island you had to visit in order to acquire what's widely considered the ultimate Materia of FF7. This Materia is one I mentioned above - "Knights of the Round" and the only way to acquire it was through the use of a Golden Chocobo. 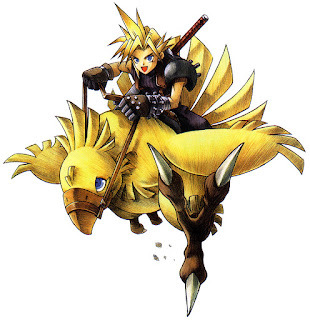 As mentioned, Chocobo's are big, yellow, mountable birds. You can race them, feed them, capture them and breed them. They come in many colours but their trademark colour is yellow. Yellow was your most basic bird, while pale blue could run across shallow water, red across mountains and the gold one (for that extra sheen every bird deserves) was your key to reaching said island. The only trouble was acquiring one, which could take absolutely hours of breeding. At the time, as an impatient 14 year old kid myself, I cheated, giving myself infinite Limit Breaks for the optional Weapon Bosses and also to gain use of a Golden Chocobo. It's bold to admit and I don't regret doing this, but I know fans of the original title who watch Game of Thrones would be "Shaming" me right about now. "I'm gonna ride that Chocobo!" Back in the day when people knew what cheat cartridges were, a few determined kids made it so you could play as the main antagonist of the game (Sephiroth), while others hacked it so you could play as Aeries indefinitely (play the game to see what I mean here) and even as Zack, the character responsible for who Cloud became. If you own a PSP, I'd highly recommend buying Crisis Core just for Zack's story. You can grab the title for cheap now and essentially it's a prequel to Final Fantasy 7 and is one of my favourite games of all time. The story's lovely but at the same time, so incredibly sorrowful and depressing. Just don't expect the gameplay to be anything like FF7's original or remade self, because it's a wild departure from the original and we don't even know how the remake will play at this point. 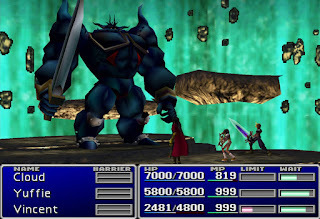 The original FF7 was a turn based RPG that involved a degree of strategy. You'd have to wait for a bar to fill up and when it did, you could attack, at which point the bar would reset for the whole process to be repeated. It kept things tense but at the same time if you could keep your cool, offered the time needed to think of your next move. In all honesty, I prefer turn based Final Fantasy titles. I really loved FF12, but 6, 7, 8, 9 and 10 really felt excitingly fast paced during battles and didn't just rely on a fantastic story. Reno and Rude from FF7: Advent Children. That's one thing I love about Square and the Final Fantasy series though; Not one game has stayed the same. With every numbered FF title, there's practically always been the tradition to create an entirely new gameplay system and experience, presumably to keep things fresh and it really works. FF7 had Materia, 8 had the Junction system and 9 had the Trance/AP system. From each of these, I'd say for me FF8's system was the most unique and my personal favourite, but the point here is each of these titles have their own unique system which has always remained memorable and iconic to that specific release. I feel the issue with more recent Final Fantasy's is that they're just not as imaginative as their past titles, feel incomplete in some way or just seem to generally lack the spark of past great releases. For me, the FFXIII series felt too automated. I didn't feel I was in control as much as I wanted to be as it seemed like the game did most of the work for me (especially in XIII-2, where I could just literally keep mashing auto-battle, occasionally healing the odd time I needed to). Past titles allowed you to be a lot more creative in your approach and gave you many options (moves/magic/ultimate or unique attacks) to choose from. I really loved this and hope to see a return to glory with 7's remake. Also memorable is the musical score of each title. Nobuo Uematsu is a genius as far as I'm concerned. He's created the music for virtually all Final Fantasy titles since the beginning and I hope he stays on board for the remake, regardless of the fact Takeharu Ishimoto has also composed the soundtrack to many Square titles and will likely have input with this also. Below I've included just one of my favourite songs from Final Fantasy 7, though if you're new to the series, it's worth scouring Youtube for the whole OST (Original Soundtrack). As much as Square and Tetsuya Nomura promise to change as little of the original content possible, there will be changes, because the direction of the gaming industry has shifted as a whole. Times have changed and with it, so have expectations. Square have to now cater to both the new and old fan base and somehow reach a happy medium where everyone's satisfied with the final product. The pressure's going to be immensely high until we can experience the remake for ourselves, but if they succeed in creating something fresh and yet true to the original title, I'm certain we'll be in for the ride of our lives.